I got an interesting email a while back from a distrubutor of cages in the UK. It’s an online company and they sell bird cages. They wanted me to do a post on this blog about their company. Well, that was fine and dandy, I don’t mind reviewing products and rendering an opinion. But there were some little problems with it. Some of the cages were just sooo wrong, I wouldn’t have used them as a towel rack. And the cage size recommendations were atrocious. 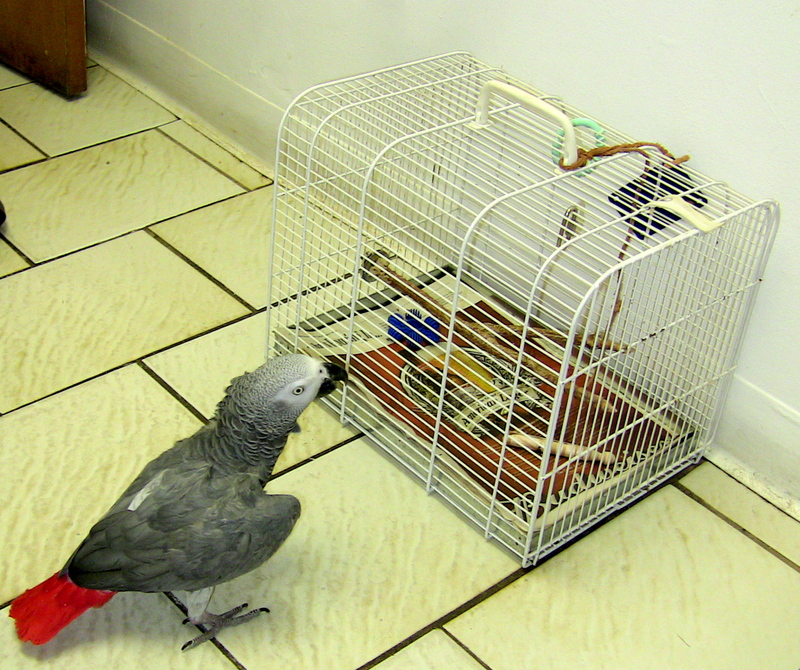 They were recommending cage sizes for African Greys I myself wouldn’t have used for a budgerigar. They had round cages. They had cages with all that “fancy-schmancy” scroll work a bird could get their foot or other part of their body stuck in. I emailed them back and gave them my opinion. They changed a few things, but for the most part, it still wouldn’t fly. And they kept bugging me about it. I told them that unless they did a complete overhaul on what they were selling in their line, get rid of the band aid-box sized cages altogether and get their size recommendations in line, they didn’t have a prayer. They changed one or two things, but finally went away when I told them that they weren’t quite comprehending the changes that they needed to make. The sad thing was, they really didn’t see what the problem was. Here’s the deal. I’ve said it before and I’ll say it again: “Parrot Nation” is about information and education. And if I have anything to say about it, it’s about good, solid information. And if we have some fun along the way, great. I don’t know everything and I have never claimed to know everything. But I’m smart enough to know when I don’t know something and I go to sound reputable sources to get the straight skinny on what’s correct. There are other bloggers around who write about birds and different aspects of the field. I’m in great company. And slowly but surely we and all of the people who post their ideas and methods on Facebook are slowly and surely changing the face of aviculture. We are all changing what used to come from the top down. And while I don’t begrudge the information we had before, what we know now is far better quality and far more extensive. 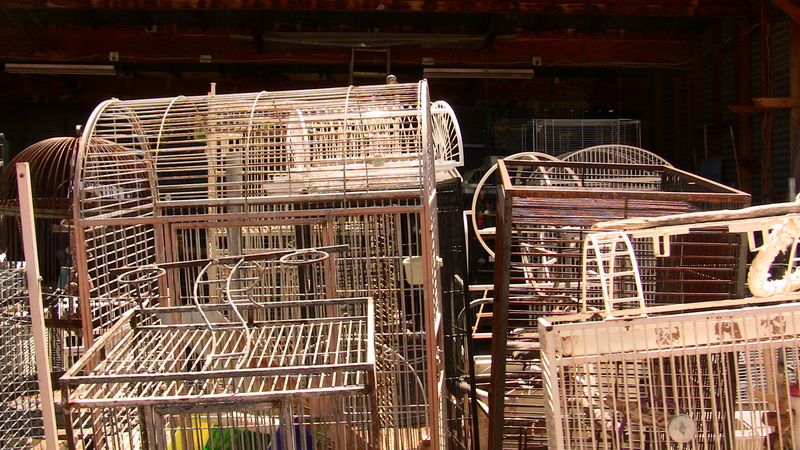 A good cage for transporting your bird; not for living in! More and more people have become aware that an all-seed diet blows. People know that parrots need showers. That they need larger cages. Round cages aren’t the best idea in the world. Foraging and enrichment are not only wonderful concepts for your birds, they are crucial. We’ve come a long way. But we still have a long way to go. And it’s not about the things you are doing. You are here. You know this stuff like the back of your hand. It’s those (and please forgive me for using this word, but it’s fitting) nimrods that have a bird or two, and dutifully go to a Big Box pet store, buy ten pounds of seed and call it a day. And I have heard this so many times: But he likes it! Bite me. I don’t give a damn whether you think he likes it or not. You don’t feed your kids nothing but french fries and diet coke and get away with it for very long. It’s our responsibility to feed our birds a decent damned diet, give them decent housing and opportunities for enrichment. And by the same token, if you see someone doing something really stupid, like feeding their birds nothing but seed, it’s your responsibility to set them straight. So you see? We are changing the status quo. We are feeding vegetables. Our birds are getting better environments, better diets, better health care and better treatment. But as I said, we still have a long way to go. Patricia, I LOVED this post! You are so very right on all counts, and yes, there ARE a lot of “nimrods” out there (that word is just SO fitting sometimes)! We DO have a LOT of work to do in setting them all straight. I must admit that I kept my cockatiel in a round cage at one time, BUT that was MANY years ago – before I knew it wasn’t a good thing. 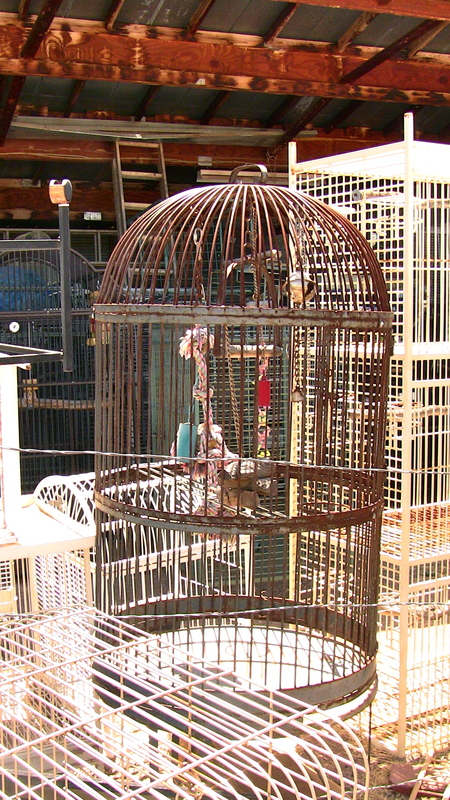 I thought I was doing the right thing – it was a BIG round cage, but when I found out that round was not sound, I was on the lookout for a proper cage to do right by my bird. With all the information that is available to anyone today, there is NO excuse for not doing things properly – if a person WANTS to learn, they can. My birds eat better than I do at times. I’m glad to report that a local “big box” pet store here has all but stopped selling tiny cages after I complained several times. Halleluia – there’s ONE needle in the haystack, – but we have to start somewhere, right? We have our work cut out for us in changing the ‘Status Quo’. You see? You made a difference! And don’t feel bad about the round cage. How would you have known? You learned, you made the change and now everything is fine. Never feel bad about learning. Great post!!! Education and good reliable resources are a MUST. I have been kicking around the idea of going to the local (privately owned) bird stores and offering a free class on beginning bird basics. Stuff like feeding, housing, enrichment, training, foraging, where to get good and reliable information, etc… Yes you can find all that information in books and magazines but FREE is the key here. I am not an expert by any means and if something like was available to me when I got my first bird I would have jumped on it. I had to search for information myself and really wade through all the BAD advice that is still out there. It starts with one, imagine what the whole parrot nation can do. Great post! The sad thing is that there are nimrods who work in the chain pet stores that sell parrots and don’t have a clue about parrots. I stopped in one to pick up some chew toys for my dog. I saw a macaw in a cage that was too small for him, one perch, I repeat ONE perch, and no toys. I called one of the employees over and pointed out all of the above. His response was that they didn’t have bigger cages and that the macaw “destroyed” any toy and any other perches that were put in the cage. I asked for the manager and told him that if they were going to sell birds THEY should have the proper supplies and someone employed that KNOWS birds. I’m sad to say it fell on deaf ears. This is so right on. I love the “But he likes it! Bite me.” in your post. Of course he “likes it.” What other choice does he have, starvation? Gees people, get with the program. Read, learn, do better, and like Pat says, “set them straight” if they are doing something dumb. And, keep learning yourself. One of my favorite articles by you in a long time!! My dad has a small bamboo round cage in his living room, but the only birds he keeps in there are small stuffed ones (they don’t mind it!). I use a cage that is supposed to be for parakeets (WAY too small for even those) as a travel cage only for mine. Granted, I did recently go to my mom’s and these travel cages were occupied for one week, but I made damn sure my 3 feather-heads got to come out when I was home. I got smart with my grey and learned how to collapse her regular cage, load it into the back of my small Neon, and put it back together again in record time (15 minutes). I guess the point I initially made with you is that the Big Box pet stores do try to convince customers to purchase these $36 cages for parakeets and cockatiels and conures, but I still follow the “three wingspan” rule of thumb for sizes. I am interested to know the name of the UK company! I live here! You may think this is unbelievable, but there are people in the UK and probably elsewhere too in the world, who have bought parrots and cockatiels, and think that they need to be fed at the same time as the children in the family. One teaspoon of seed in the morning and another teaspoon of food in the evening. Water is also just a sip at both meals. Well, bless your heart! Your ideas seem right to me. Those cages look small and have such odd shapes. Be hard to clean too! That one by the cute grey looks like a little travel cage to the vets. Too small for even a parakeet or canary. Thanks for educating readers about proper cages! I have a website where I pull listings from Amazon, so I don’t stock merchandise and I don’t even have full control over what products get pulled in, but I make damn sure that there is lots of information all over the site about how to pick a good cage. I know lots of people assume that tiny cages, or round cages, are fine for their birds — after all, someone is advertising them as appropriate, right? — but as you said, it all starts with opening people’s eyes to better ways. Even if it means I risk making fewer sales, I make a point of pointing people at more appropriate items. My first priority is education, not sales. I don’t consider it a luxury, but a duty. But I put the information right on my homepage, too, so it’s the first thing people see.